Not only did the Chicago Bulls not show up last night, their lack luster performance was the equivalent of giving the finger to their fans. 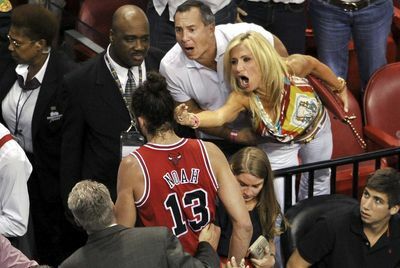 No better show of it than the Miami Heat fan who let Joakim Noah know exactly what was on her mind. The Heat ran a clinic on the Bulls, that had the making of a Varsity vs. JV inter squad game, practice for the seniors and the youngsters looked just in awe to be in the same gym. After playing their hearts out in game 1 the bulls took the night off and the heat went to work dominating every aspect of game 2. They showed why they are to be feared in the playoffs and when determined they look to be unbeatable. Whether inside or outside the King orchestrated the nights events like no other, took no prisoners and sent the Bulls back home to contemplate how much longer will this series last. At this rate the Chicago fans maybe the ones next showing their emotions on the hardwood.